Most of us have heard of the therapeutic benefits of bathing in the highly saline Dead Sea. Imagine immersing yourself in the warm, salty waters of a prehistoric sea like that... Well, it might not be as far fetched as it sounds. Himalayan salt was formed around 250 million years ago when volcanic activity dried out an ancient seabed leaving the pristine salt deposits under a thick layer of volcanic rock. Since this point, Himalayan salt has been devoid of all environmental contamination, making it the purest form of sodium on the planet. In addition to its unrivalled purity, Himalayan salt also contains a wide spectrum of minerals found in the human body. In fact 60+ different minerals and trace minerals can be found in these unique salt deposits. There are many ways that Himalayan salt can be used to benefit our health, ranging from simple use as a condiment in place of highly processed table salt, to a daily drink of 'sole'(so-lay) (a saline solution of Himalayan salt dissolved in distilled water). 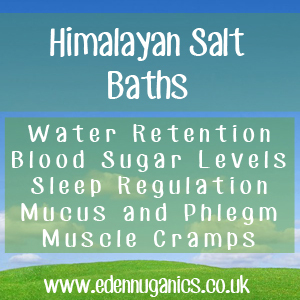 But above all, the most popular uses for Himalayan salt is adding it to bath water. The first step is to wrap around 500 grams of Himalayan rock salt in your cheesecloth and secure the top using a piece of string. Adding your salt rocks to the cheesecloth enables it to act as a giant tea bag in your bath while preserving the rocks for future use. We have found this to be, by far, the most cost effective method, as it avoids undissolved salt going down the drain after your soak. Once the bath is full, add your DIY salt tea bag to the water and wait for around 10 minutes, this allows time for the salt to infuse with the water. Remove the salt bag before soaking to avoid soap and cosmetics spoiling the salt, allowing for future use. Voila! Time to jump in and enjoy. Make sure to have some cold water to drink (to replace toxins in fluids you will sweat out) and a cold face cloth to hand for your forehead. Take care when getting out of the bath and take it slowly, as the heat and increased circulation can make you a bit light-headed. If you are pregnant, breast feeding or suffering from a serious heart condition use a smaller quantity of salt to reduce the effects.